When I took my first painting class at UNT, the TA had us do two black and white paintings – one in acrylics and one in oils. That way we could test out the properties of each before buying a whole set of paints. I picked acrylics, mainly because I’m impatient and messy. And I like the fact that they clean up with water. That whole semester, several of the other students would pass by my easel and say “You look like you’re having fun.” I wasn’t quite sure what they meant, but looking back, I realize that it’s probably because I had paint all over me, as well as my canvases. I’m still like that. Today I’m sorting through my acrylics to see what needs to be re-ordered. I’ve got several students, and right now they are all painting in acrylics. Funny thing is, now that I’m using encaustics more, I have to use oils because they are compatible with the wax. But I still use the acrylics in my mixed media journals and ATCs. And there are so many additives you can add in to play with the texture, dry time, consistency and transparency, that acrylics are still hard to beat. I used acrylics on the Emotional Landscapes and Domestics series on my web site, and as underpaintings on some of the art in my New Work Gallery. So, how about you? Do you use acrylics? Which ones are your favorites? I’ve been using Golden brand acrylics. If you haven’t tried the flluid acrylics, they’re really different. Love the transparent look. Finally learned how to apply a wash. First wet the surface with a thin layer of water. Then add a thin wash of medium. Then a thin coat of fluid color. Great transparent wash! Try the green gold. The possibilities are endless since you can use either a glossy or matte medium. 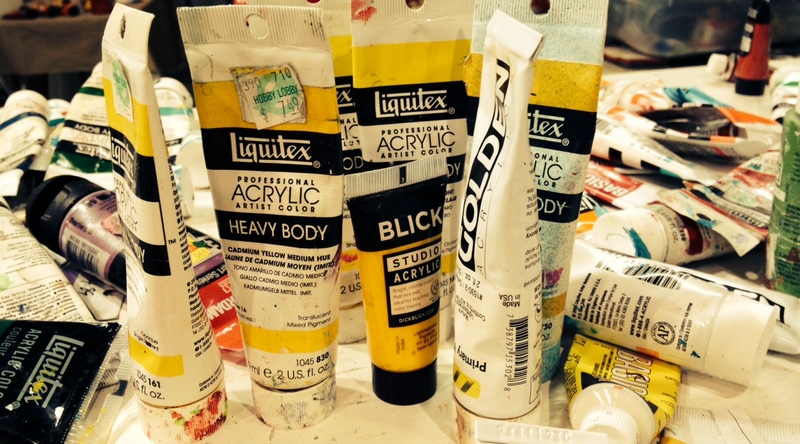 Yes, Golden fluid acrylics are on my wish list! I’ll have to try them soon. Thanks for your tips!